AFC Littlehampton Ladies' League Cup first round clash at Horsham was abandoned on Sunday. Golds were leading 3-1 when a home defender suffered an injury, forcing a ten-minute stoppage before the referee abandoned the match after 72 minutes. The pressure on the Horsham defence was relentless from the first whistle with the home team struggling to clear the ball from their own half. It was only a matter of time before the deadlock was broken. Up stepped the impressive Pippa Langridge to smash the ball in from close range to put Golds in front. A first half totally dominated by Littlehampton certainly would have looked good on the percentage of possession, however, the 2-0 advantage at the break did not reflect how one-sided the match was. The second goal was a piece of brilliance from captain Steph Carter, who avoided a couple of Horsham tackles on the edge of the 18-yard box then feigned to shoot once and unleashed a delicious left-foot curler past the Horsham goalkeeper. Horsham came out with a little more fight and enthusiasm after the restart. 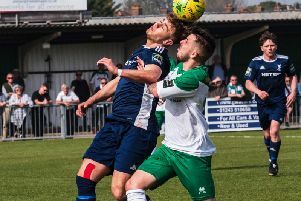 A Littlehampton defensive mix-up ended up at the feet of a shocked Horsham striker who couldn’t miss an open goal from six yards. The introduction of Mel Miller on the hour, to join the Golds strikeforce, saw her make an impact. She was on the end of the most perfect piece of play from the Golds. Emma Chrimes turned two Horsham defenders and played a lovely weighted pass through to Miller who calmly slotted by ball in the net from four yards. It was on 75 minutes, however, that the game took a strange turn. Following a poorly executed tackle on Chrimes, the Horsham defender took a self-inflicted knock which stopped play for a good ten minutes and although eventually leaving the field of play unaided, the home side decided they didn’t want to continue the game. Despite having plenty of available players to see out the remaining minutes they chose to abandon the game, a decision that wasn’t challenged or questioned by the referee. As far as AFC Littlehampton Ladies were concerned, however, the result should stand and Golds move into round two. Golds’ central midfield maestro Becky Beale was outstanding and quite correctly collected player of the match.